Nearby, a golden eagle (or maybe just a turkey-shaped piñata, painted gold) was placed on an altar in the center of campus for the annual Homecoming sacrifice. APSU Latin professor Dr. Stephen Kershner sacrifices a golden eagle during homecoming. For years, Austin Peay’s classics program has used the event to support homecoming festivities while also teaching the public about ancient Greek and Roman traditions. 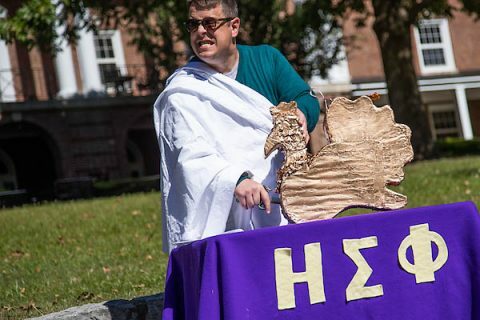 Student members of the University’s Eta Sigma Phi Classics Honor Society wore makeshift togas and made noise to wake the gods during Monday’s event. Moments after Kershner called, in Latin, for the Tennessee Tech Golden Eagles to be unable to catch a pass, he drove a knife into the piñata. The fake bird’s carcass was later placed in the fire at Austin Peay’s annual bonfire. 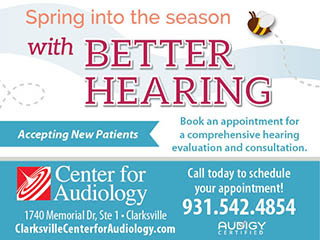 For information on Austin Peay’s classics program, visit https://www.apsu.edu/classics/.